Testifies that his wife was book for a surgery to deliver her baby. She refuses and the doctors release her in a very bad condition. But with prayer and perseverance and the Word of prophecy they received from the man of God Prophet Ekene about the baby while still in the womb…they trust God for safe delivery! He went home with his wife. And after three hours while he was looking for someone to assist them he just heard the voice of a bouncy baby girl named (Angela) Glory to God! His wife delivers safely at home without any surgery or doctor! 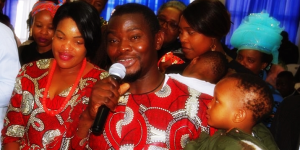 He went on and tells how he was a chain smoker – but since he receives a touch from the man of God Prophet Ekene…he stops the habit of smoking. He continues by telling us that he is a petrol attendant and receives little income. But during this prayer they increase his salary with an extra R2000….which was very rare….it can only be God. We thank God for the wonderful breakthrough. That can only be God! He receive his key….Receive your own today in Jesus Name!